As soon as on May 27 starts the 58th Krakow Film Festival. As every year, the festival will be accompanied by many industry events, dedicated to film professionals present at the festival. We would like to invite you to familiarize yourself with the programme. One of the main events of the KFF Industry is KFF Market– a digital video library, in which, throughout the entire festival week, one can watch the latest films from around the world, which are looking for cinema, festival and television distribution. In this year's catalogue, there are about 250 documentary, short and animated films, including the festival's competition films and sections prepared by the partners: Institute of Documentary Film, DOK Lepizg, Thessaloniki International Documentary Festival, Festival dei Popoli. For the fourth time in Krakow will be held one of the DOC LAB POLAND sessions, co-organized with Władysław Ślesicki Film Foundation. 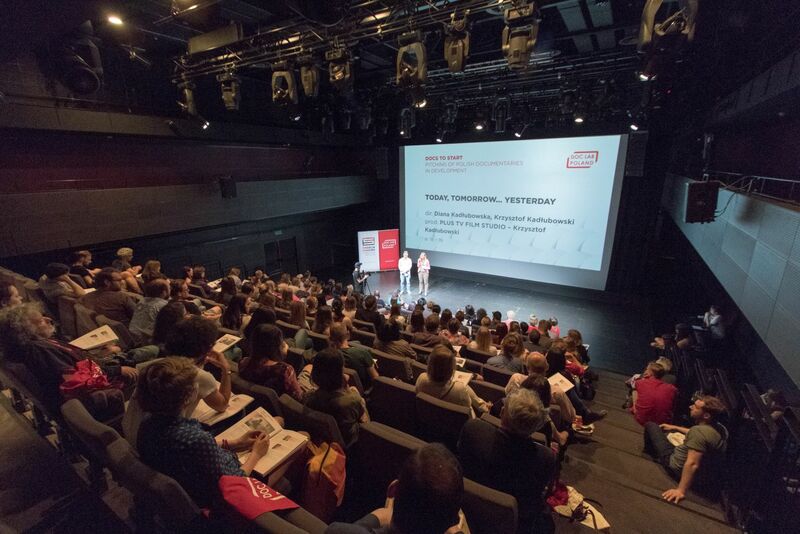 DLP is a series of workshops and consultations for directors and producers of Polish documentary films which ends with two pitching sessions: DOCS TO START and DOCS TO GO!. DOCS TO START is a presentation of Polish projects at the stage of development, whereas DOCS TO GO! is a presentation of Polish documentary films at the stage of editing or post-production. Both sessions eventuate in the meetings with festival programmers and sales agents. Organized for the producers looking for production partners, DOC LAB POLAND Co-production Market includes individual meetings with international decision makers from the film industry and foreign producers, who are open to co-operation with Poland. There is another event - sneak previews of Polish documentary films, closed to the public - DOCS TO BUY. After the screenings, there will be meetings between producers and international online and VOD distributors, invited specially for this occasion. Traditionally, the KFF Industry Meetings will be held. These are daily consulting individual meetings with experts (distributors, sales agents, buyers, film festival programmers), dedicated to filmmakers, producers and people working in film distribution. These meetings will be followed by KFF Industry Drinks – daily informal networking meetings accompanied by a glass of wine. An important event will be the Master Class of this year's winner of the Dragon of Dragons award at the 58th Krakow Film Festival – Sergei Loznitsa, an acclaimed documentary and feature filmmaker. During the Master Class, the director will tell about his style of work which oscillates between documentary and feature movie directing. The Dragon of Dragons will support his considerations with fragments of selected films. The special guest at this year's 58th edition of Krakow Film Festival is Estonian cinematography. The programme "Focus on Estonia" includes screenings of selected latest Estonian documentary, short and animated films. An important event of the section is the Conference, the aim of which is to present the model of contemporary Estonian cinema (starting from the most important movies and directors, through film institutions and festivals, ending with production and financing of documentary films). The guests of the panels are Estonian producers, distributors, TV editors, representatives of institutions financing film projects and representatives of Estonian film festivals. Key note speakers include, among others, Priit Pärn (Estonian Academy of Arts: Animation Department), Priit Tender (Festiwal PÖFF Shorts), Riho Västrik (Baltic Film, Media, Arts and Communication School/Vesilind), Filipp Kruusvall (DocPoint Tallinn), Laurence Boyce (Festiwal Black Nights -PÖFF), Kaarel Kuurmaa (Estonian Film Institute), Karlo Funk (Estonian Public Broadcasting), Marianna Kaat (Baltic Film Production). In the programme of KFF Industry, there must also be a place for animated films. Within the frames of the section Animated in Poland, there will be a pitching of Polish short animated films in the final stage of production. The representatives of the selected projects will have a chance to show their excerpts and to talk about their films, before they are shown at Polish and foreign film festivals. Animated in Poland includes also a special event – panel “It’s short time” – organized by KFF Industry and Munk Studio which celebrates its 10th birthday. 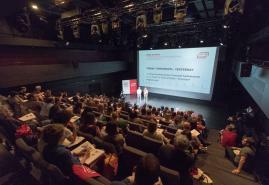 The participants will be the programmers of the film festivals in Venice and Berlin and decision-makers for the European Film Awards and European Short Pitch. This year, in cooperation with Krakow Film Music Festival, two discussion panels on music in documentaries will be organized. The first of them, whose guests will include Petro Aleksowski and Michał Jacaszek - director and composer of the film "Aborted Mission" (presented in the Poland Panorama section) and Marta Prus, Maciej Kubicki and Mikołaj Stroiński, authors of the film "Over the Limit" (presented in the Polish Competition and the International Documentary Competition of the 58th Krakow FF), will discuss issues from the point of view director's cooperation with the composer. The second one, in which their participation confirmed Michał Woźniak, music composer (among others for films "All About My Parents", "Mr. T." and "Manhunt"), radio player, musician, sound producer and music producer, Petro Aleksowski, Michał Jacaszek, and also Maciej Bochniak and Mikołaj Pokromski – the creators of "Ethiopiques – Revolt of the Soul" (presented in the DocFilmMusic competition at the 58th Krakow FF) – will address the legal issues of using music in the film. The partners of KFF Industry 2018 are: Władysław Ślesicki Film Foundation, Munk Studio - Polish Filmmakers Association, Krakow Festival Office, Krakow Film Commission, MOS, Małopolska Voivodeship Public Library, AMSO, Kancelaria Lassota, Krakow Technology Park, Sound Mind, Audiovisual Technology Center. You can find more details and the complete programme here.